Other Common Names: Sarvisberry, shadbush, bilberry, Indian pear, les poires and sugar plum. White flowers usually bloom before leaves are fully grown. Each flower has five long bright white petals. The flowers usually grow in clusters at the end of new growth, although at least one Canadian species has flowers growing from the leaf axils. They bloom anywhere from March to June, depending on the species and its location. The red or dark purple fruit are typically sweet and juicy, although some, like Amelanchier arborea are drier and don’t have as much flavour. They are all edible although, with local conditions such as soil and weather dictating their exact taste and juiciness. 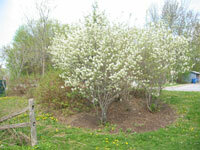 In the spring, Amelanchier blossoms entice beneficial insects, such as bees and butterflies, which provide that ever necessary service of pollination. As they are early bloomers, they are a very important source of food for these emerging insects. By the summer, the fruit is ripe and both birds and animals come to enjoy their delicious and nutritious bounty. According to Doug Bennet and Tim Tiner, authors of Up North Again, serviceberries have a sugar content of 20 per cent and are sweeter than blueberries and raspberries. They also contain minerals such as iron and copper. Many species of birds feast on the berries, including orioles, thrushes, woodpeckers and waxwings. Some are also known to nest in its branches, such as robins and cardinals. In addition to birds, mammals like squirrels and chipmunks will eat the fruit while larger animals such as moose, deer and snowshoe hares may browse on leaves and twigs. Serviceberries are also important plants for the larvae of certain butterflies such as tiger butterflies, viceroy, admirals and others. With its springtime blooms and summer fruit, serviceberries have much to offer Canadian birds and beneficial insects. And it just so happens that they look good, too. Serviceberries, known to plant buffs as the latin Amelanchier, are found across most of Canada, growing in a variety of conditions. The exact number of species is hard to say, as botanists can’t always agree on classifying the species. Approximately 10 to 15 species are considered native to Canada. Their usefulness and versatility have earned them a warm spot in many a gardener’s heart. Some are bushy while others grow to be small or medium sized trees. They can stand alone or provide a backdrop in a garden bed and many tolerate poor dry soils. Your garden and location will indicate which one is best for you. The Canadian Wildlife Federation demonstration gardens have a few species growing. Only our Amelanchier Canadensis is mature enough to provide a big show. In the early spring, I get a thrill out of seeing their profusion of white blooms splash against the blue sky, especially when so few other plants are flowering. It makes me look forward to seeing the others grow and brighten up other corners of our garden. As with many species, it is known by several common names, depending on where you live. Serviceberry is considered a derivative of sarvisberry, which in turn comes from a Latin word for a European tree with similar-looking fruit. Some people, such as Maritimers, call them shadbush which points to their blooms coming at the same time as the run of an Atlantic coast shad fish. Some other names you may recognize are bilberry, Indian pear, les poires and sugar plum. One variety, the Saskatoon berry, once grew in such profusion in the Saskatoon, Saskatchewan region that it inspired the people of that area to take on its name. Natives used them fresh or dried, even those of Amelanchier arborea, but they can also be cooked for jams and put in muffins. People have also made use of their hard wood for small items (as their trunks never get very wide) such as tool handles, walking sticks and fishing rods. If you want to try planting seeds, collect some berries as they are turning from red to purple to ensure you get a few before the birds eat them all. Clean the seeds of pulp and plant right away or in the autumn. If you keep them for another time, remember to put them in a plastic bag with a bit of moist earth or paper towel and leave in the fridge for at least three months. You may have even greater success with this group of plants if you slightly scratch the seeds with a bit of fine sandpaper or a nail file before you store them away. William Cullina, author of Native Trees, Shrubs and Vines comments that with their strong wood, these plants can usually withstand storms quite nicely. They may have troubles with leaf spots, rusts and stem cankers, as with other members of the rose family. Planting species native to your location and in spots that suit their needs lessens the chance of experiencing these diseases. • Habitat : Rocky ridges, along streams, forest edges, open woodland, sandy and rocky woods. Prefers full sun, but will also tolerate partial shade, and dry to moist soils. • Appearance : Grows up to three metres and forms thickets, has oval leaves with rounded tip and fine hairs along midvein. The flowers often precede the leaves. Considered to have the sweetest and juiciest fruits of all Canadian Amelanchiers. • Habitat : Forest edges and clearings, fields, dry soil, rocky or sandy areas. Prefers full sun to partial shade and well-drained soil. • Appearance : Can grow to a small tree size up to 10 metres, leaves tapered to a point at tip and hairy when opening – hence their common name of ‘downy’, hairless or slightly hairy along veins on underside at maturity. • Habitat : Swamps, thickets, riverbanks. Prefers sun to partial shade but may tolerate full shade, moist soil. • Appearance : A small shrub that can grow to seven metres with oval leaves that are partially opened at the time of flowering. • Habitat : Moist woodlands, ridges, clearings and roadsides. Prefers full sun to partial shade, moist but well-drained soil. • Appearance : Grows to small tree size of 10 metres. Leaves pointed at tip and partially grown at the time of flowering, hairless and coppery-red colour while unfolding. • Habitat : Sandy and rocky areas such as dry woods, cliffs and dunes. Prefers full sun but tolerates partial shade, average well-drained soil. • Appearance : a suckering shrub with oval leaves that can spread to form thickets, grows to two metres tall.